Before I left, I had watched the movie “Arabian Lawrence”. I was not so easy to endure the movie that was supposed to have taken place in the Jordanian deserts and referring to the British policy in the Middle East and the methods used. While travelling to Jordan, I had some concerns about going to this geography in a troubled period, as well as the curiosity of seeing the deserts and landmarks of the events in this movie. However, we did not have any problems with security throughout the entire trip. During our trip, our bus had a tourist police along with a guide. In this article, you will find pictures and information on the historical and touristic attractions of Jordan. But in order to get to know this country, I have also shared the information about my own researches under “For Those Who are Interested” sections. If you are rather interested in the places to visit, I would suggest you to skip these parts and then continue reading. Jordan is a country with Syria in the north, Iraq in the northeast, Iraq in the south, Saudi Arabia in the east and Israel in the west… Since the country is situated at the edge of the Arabian deserts, it had strategic importance during the course of history. According to historian Bernard Lewis, the greatest cause of wars in the Middle East, both past and present, has been the desire to seize or control trade routes between the East and the West, along with the struggle for territory. After the Battle of Marj Dabiq, in which the Ottomans defeated the Mamluks, Jordan became an Ottoman land from 1516 until 1918. After the World War I, Iraq was established as a monarchy under King Faisal, the son of Sharif Hussein. On the other hand, an Arab Emirate named Trans-Jordan was established where Sharif Hussein’s other son Abdullah took over.Trans-Jordan won independence in 1946 and was named Jordan. Today, Jordan, as the Hashemite Kingdom, is ruled by the constitutional monarchy. King Abdullah II has been ruling the country since 1999. Our trip commences from the capital city of Amman. While visiting the streets of Amman, it is possible to see modern high-rise buildings on the one hand and yellow old houses with flat roofs on the other side. Amman, a city founded on seven hills at the beginning spreads over seventeen hills today. On one of these hills is a Roman castle. Columns that are still standing in the castle and flat-roofed houses lined up like lego on the slopes of Amman can be seen among the arches. A giant Hercules statue has only fingers left. When looked at the size of the fingers, one can figureout how gorgeous the statue was. Inside the castle, remains of structures such as water cistern, Byzantine church and a mosque built during the Umayyad period can be seen. In one section, old medical instruments are on display. There are three holes on this skull. It’s a method used to treat mental illnesses and brain edema. With these holes opened in the skull with thin metal rods, treatment has become possible by dysfunctioning certain areas in the brain or reducing the pressure by discharging the edema. The other statue that was found during the construction of a road is claimed to be the world’s oldest human sculpture made in 7200 BC. After having watched the sunset at the castle we descended to the city and strolled into one of the streets in the consideration that one would not leave the Middle East without eating Kunefe. Although it was evening we waited in a long queue. Cheesed and creamed Kunefe were served hot and you would take the plates in your hand and eat on the street. The taste was not extraordinary, but it was very enjoyable to wait in line in the street with warm people and chat with Jordanian women while eating fast. The next day there was a long desert journey ahead of us. Ashabı Keyf, “Seven Sleeps”, is a known story …There are several places in the world that are believed to be “Ashabı Keyf” cave (For instance, those in Tarsus and Ephesus in Turkey). There is a mosque on top of the hill where the cave in Jordan is. When entering the complex, women are given clothes like hooded cloak. It is imperative to wear them whilst visiting. Here we prayed and hit the road again. While traveling by bus in the desert, the endless view of yellow sand without any vegetation (only thorns) darkened my soul after a while. The camels, who are the only animals compatible with the desert environment, can stand for a long time without water by eating thorns. In the past, structures such as inns, castles, and pavilions were built, corresponding to a day’s distance, to meet the resting and safety requirements of the caravans on the tough conditions. We saw three of these. This structure in the midst of the vast desert was built during the Umayyad period (710 AD) and used as a caravanserai hotel. It is made of volcanic limestone blocks. There were also small volcanic stones around the layers in different colors. This pavilion is situated on the junction between Iraq-Arabia-Palestine-Jerusalem. The small slits in the walls were used for surveillance purposes, as well as providing lighting and ventilation. On the lower floor there are rooms where the animals stayed on the edge of the courtyard. On the upper floor, there are small sized accommodation rooms. Being the part of the World Cultural Heritage List, this pavilion was built in the 8th century. Umayyad Caliphate might have built it with the aim of resting or moving away from the city. Only the reception hall and the hammam part survived to our day. There is tepidarium, caldarium and service section in the bathhouse. It seems to be a serious effort to supply water for such a bathhouse in the middle of the desert . Our guide says the water is collected from the wells. He also added that the paintings in the hammam, which are still solid, reflect the art of the Umayyad period…All the walls are covered with the depictions that we are not accustomed to see in Islamic art. The frescoes on the walls are fairly astonishing…There are pictures of dancers, animals like dogs, deer, gazelles and camels, hunting scenes, and others representing astrology, stars and horoscope in the pool. On the ground are mosaics. There are also pictures showing the triumphs of Umayyad troops. There are sources claiming these paintings to be under Greek and Iranian influence. One of the wall pictures herein is presumed to be conveying a political message. In this picture, six infidel rulers were depicted obeying the seated Caliphate. Four of the names of monarchs written in both Arabic and Greek alphabets were legible. Caesar (Eastern Roman Emperor), Roderik (the last Visigoth King of Spain), Persian Emperor and Emperor of Ethiopia…The other two are not known as the pictures are in ruins. A palace in the middle of the desert, a bathhouse with unusual pictures; they surprised me. But since the pictures are partly distorted and there is little light, I could not take good pictures to reflect this environment sufficiently. If you are interested, I suggest you to check “Kuseyr Amra” photos on Internet. The castle gate is made of two-winged stone blocks. The opening and closing mechanism is still working. It is said that there is no other example in the world. The holes on the castle door were used to pour hot oil. When we enter through the stone gate, we see small holes carved on the floor. These holes were used by soldiers and people to linger and spend time by playing chess, checkers and similar games. There are many buildings around a big and gloomy square. The room that Lawrence used was on the second floor of one of them. There is also a mosque inside the castle. We continue our journey in the desert and arrive at Jerash, an ancient city. The ancient city founded at around 100 AD reached its economic and social peak around 200-300 AD. During these periods, trade caravans began to cross here, erasing Petra’s dominance. The city of Gerasa, which dates back to 6500 years ago and also referred to in the Bible, reached its peak during the Roman period. It is located 48 km north west of Amman…Though the Aramaic language was used on daily life, Greek was the official language. The city being a crowded commercial center during the Roman times suffered a devastating earthquake in 749 AD leaving most of the buildings in ruins, partly under the ground. It was discovered in 1806 by the German orientalist Jasper Seetzen. It is said to be one of the best preserved Roman antique cities. We entered from a magnificent gate built in 129-130 AD to commemorate the visit of the Roman Emperor Hadrian to the city and began to walk on the main street. It is a stone road with structures on both sides. These small rooms, located side by side, are shops with colorful mosaics on their carpet-like floors. It makes you think that as if you hear the noise of caravans passing by, the bargains made in the shops, maybe the sounds of the intrigues from where they are hidden between the stones. Marianos Church was actively used between 570-749 AD. Some of the mosaics of the church remained intact and the letters therein are legible. Hippodrome was used between the years of 220-749 AD to entertain the people and for various competitions. As far as Rome is concerned, one always thinks of slavery and brutal nobles; but people were supposed to be lingered through entertainment. There is a spectators section, carved out of stone and still partly intact around the 50 x 250 meter square where sports events were materialized. Nowadays, there are festivals on this ground where gladiator demonstrations are made. The stone road next to the city walls goes down to the south gate. The southern gate leads to the southern road, a stone road (south street); made in 110-300 AD. This road is heading to the oval plaza with magnificent columns. I got so caught up myself that I could not take a proper picture that accurately reflected this area. It is a gathering (forum) area surrounded by very elegant columns. It gives you a feeling of spaciousness that you will want to sit on stone steps and watch around for a long time. This area, built in 100 AD, was surrounded by 160 columns. Now only 60 of them are intact. Cardo Road, reached after the oval plaza, was built in 120-170 AD and leads to the Temple of Artemis. You walk about 800 meters through unspoiled smooth stones; there are elegant columns on the both sides of the road on which horse carriages, slaves and kings used to ride. Macellum (Indoor) food stores (It is marked as “Food Market” on the signboard) were used between 190 and 850 AD. There is an area like a pool in the middle and carved stone columns around it. The Nymphaeum is named after and dedicated to “nymphes”, the water, forest and mountain fairies in the Greek mythology. They are monumental fountain structures in the Greek and Roman architecture with niches, carved on the rock, shaped like a house and decorated with column rows and sculptures. Such structures were built in many places where water was needed in the city. Just passing by the temple of Zeus, where only the remnants are seen, we proceed to the amphitheater. Despite the collapsed sections, the aesthetics of the stone carved walls behind the scenes and the acoustics of the space are remarkable. Here a group of musicians played Turkish music with local instruments. The museum is closed down before it gets dark due to security measures. There was a colorful sunset while we were leaving the antique cit in haste. The city of Salt was an administrative unit affiliated to the Province of Sham in the Ottoman period. It was located on the old main road connecting Amman to Jerusalem. The city’s alleys consist of shops where everything irrelevant to each other is sold side by side. When you go up to the top, different architectures of structures used as administrative buildings during the Ottoman period catch the eye. Our other purpose to come to the city was to visit the martyrdom. This is the martyrdom that was built to the memory of the 300 officers, non-commission officers and privates of the 48. Division and 143, 145 and 191. Infantry Regiment of the 4th Army, who were killed while they were fighting against the British troops in the Salt Zone between March 24-26, 1918 during the World War I. In 1973, a mass grave was found in a cave. The first phase of the monument was completed in 1989 and opened to the visitors. In 2004, the memorial was commissioned to be renovated by Military Attache Colonel İbrahim Yılmaz. When you enter the cave, seeing a sarcophagus covered with the Turkish flag and listening to the voice of the Qur’an read at the background is thrilling. It’s been fairly touchy for me. I was deeply moved up in the deep sentiments and prayed for these soldiers who were our grandfathers and gave life for the sake of the fatherland at a young age. I was also grateful for those who contributed to the realization of this martyrdom to keep the memories alive. In this part where the names of the martyrs are written, my eyes were called to see if there was any martyr from my hometown. Then I came out of the martyrdom with the pain and thoughts of what our grandfathers left behind at such a young age in these territories, now being part of another country. This is a small, clean, modern city. People are also very polite in this city with a dense Christian population and churches located almost side by side. The city is a mosaic paradise. Even the signs of the churches are made of mosaic. The most important work in this city is the partly surviving mosaic Madaba map, presumably made in the 6th century AD at the bottom of the St. George Church, one of the examples of early Eastern Roman architecture. On this map, the names of settlements in the Middle East are written and sacred lands, ancient Palestine and Jerusalem are shown by symbols. This map is important as it shows places in the Najaf Desert and others that are not mentioned in other sources as well as showing a detailed map of Jerusalem. The mosaic, found at the base of one of the old ruined churches, was unearthed in 1884. The scientists realized in 1896 that the fragment of the map, which was largely destroyed, contained the region from ancient Neapolis (today’s Nablus) to Egypt. The map was restored by German archaeologists under the chair of Herbert Donner in 1965-66. The floor mosaics of the Martyrs Church ruins, which are currently being excavated and restored by religious and international organizations, are also very impressive. But since there is an undergoing restoration, the pictures cab only be taken over its edge and iron bridges. In order to climb to the Nebo Mountain one should take a bus through the curving road, leave it in the parking lot and then walk. It is said that Moses showed up in this mountain, pointed out the land that his people should go (the promised land), then died and buried here after he traveled with his tribe in the Sinai Desert for forty years. It is possible to understand from the monument at the entrance that this mountain is considered sacred and possessed by the Christians and the Pope. The article on the monument: “A God-Everyone’s Father-Above Everything”. You climb up to a viewing terrace. Here you see a large church on your right, desert and Israeli lands facing you. At the end of this terrace, the crucified Jesus sculpture, wrapped in a snake made in iron, is interesting. This sculpture was made by the Italian sculptor Giovanni Fantoni, and symbolizes the tolerance and friendship with Moses’ staff (snake) and cross. This board, located on the terrace, shows the distances and directions of the promised lands. A new church was built over the ruins of a 4th century church on Mount Nebo. Inside, there are many windows colored with stained glass. The color of the windows gives a soft illumination to the environment. 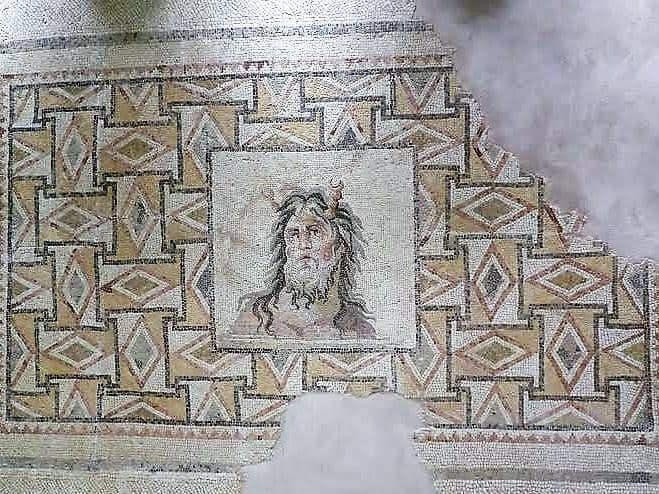 But what really interesting is the mosaics of the place that have been preserved to a great extent. Fairly detailed figures with colorful stones are depicted, events are animated. Naturally, you can not step on these mosaics. It is possible to take pictures by walking in the protected areas on the edges and on small glass paths-bridges, though. This is an urban remnant that is mostly under the ground, but we can walk through the remains. The city, the part of UNESCO World Cultural Heritage list, is said to be a settlement identified in the Bible. It is possible to see the interesting mosaic flooring in the area where Roman and Byzantine period remains are found. There is a large store by the exit where mosaic objects are made and sold. A 10×10 cm wall panel is sold for about $10. It is not cheap, but I suggest you to buy from these objects that you cannot find somewhere else. We are recommended to rest and sleep early tonight at the hotel in Petra as a tiring walking program is ahead of us on the following day. This was the part of the Jordanian trip that I was most curious about. Before I left, I had watched the related documentaries and saw the pictures. But after I passed through this entrance gate, I literally entered the “time tunnel” and wandered around for hours during the day. Petra was inhabited by the Nabataeans in 400 BC-106 AD and served as the capital of the state. The city has fallen after the earthquakes and economic turmoils around 400 AD and forgotten thoroughly over time until it was rediscovered by the Swiss traveler Johann Burckhardt in 1812. Included in the list of World Cultural Heritage by UNESCO in 1985 while it was selected as one of the Seven Wonders of the World in 1985. After the entrance gate, a 800 meter open area is passed before entering the deep valley. If you do not want to descend the valley on foot, it is possible to ride on a horse or a horse carriage. You start walking by the natural stone formations and some structures carved into these stones. At the end of this road, there are a few small shops (selling smell and soap) and benches to sit on. It is possible to sit here and see some portion of the path leading valley. After this gate, “the Siq” road starts. The Siq”, a path that runs between narrow slits and high cliffs, is a 1.2-kilometer passage. The width of sandstone rocks separated by earthquakes is sometimes reduced to 5-6 meters. There are stone walls on your both sides that can exceed 150 meters in height. Once upon a time, travelers, merchants, pilgrims and camel caravans passed through this narrow passage and entered the city. But this is not a straight road. While you descend down a slight slope, you are curving through the bends and moving in the canyon. The rock walls of the path surprise you by changing color according to the sunlight’s angle. As if red, pink, yellow and lilac colors dance on the stones…Then 8-10 year old Bedouin children gather around you and do not leave your side to sell you something along the way. They are so cute with their extraordinarily black and kohl eyes; but after a while they become oppressive. There are water ducts on both sides of the valley. At the entrance of the road, there was a dam built by the Nabataeans who tried extraordinary systems. This dam is described as a complex engineering miracle designed to prevent devastating floods. The flood waters were transferred to a borehole with the 8-meter wide, 8-meter-high and 30-meter-long “Mudhlim Tunnel” covered with ceramics opening to the rocks and a complex bend system and thus protected Siq and Al-Hazne from the devastating floods. With its astonishing water engineering, which is extraordinary for the people of 2000 years ago, the dam and tunnel that protects Petra from overflow was in fact the part of huge water management system. On the other hand, the open canal on the side of the road was used as a trough for animals. With the closed channel on the other side of the road, people were provided with access to clean water. Recognizing the importance of controlling the need for water in the desert environment, the Nabataeans have built more than twenty cisterns at different points of the city and have been able to transport far-reaching water sources to this crowded city. With the pipe system opened on the walls of Siq, the water that accumulated in the cisterns were transferred. As the sandstone rocks are water-absorbing, they have covered the channels with ceramics to prevent loss. So they had a constant source of water in the desert environment where rain was low and the temperature was as high as 50 degrees celcius. Without going to the Treasury building, which is considered to be the starting point of the city, as you descend down this valley, you see the remains of buildings, sculptures and temples around you and you encounter a different surprise in every curving bend. The road called “The Siq” is covered with stone. But as soon as you approach the Treasury (El Hazne), it turns into a soft sand. This building is a sign of the golden age of the Nabataeans. The figures in El Hazne are very different from the traditional architecture of the Nabataeans. In the early period the Nabataeans generally symbolized their gods with square stone, sacred meteorites, stone blocks, and sometimes schematic eyes and noses. However, the symbols on the flashy frontal side of Al-Hazna were ornamented with the divine figures of the Nabataean, Greek, Pagan and Egyptian cultures as well as animals and flowers. There were warriors in the Greek mythology, Amazons, the crown of the Egyptian god Isis in the center, and Medusa’ head under it. The Pagan Nabataeans, who traveled in the western Mediterranean as they were dealing with trade, were thought to be influenced by different cultures and combining their artistic styles and beliefs. On the 80% of the coins found in the excavations, there was the picture of Nabataean king Aretas and, therefore, this place is thought to have been built as a tomb for him. After El Hazne, the narrow deep valley opens into a large desert basin where the number of tombs and monuments is increasing. These are the only clues, which is referred to as “stone” in the ancient Greek manuscripts, about the lost ancient capital Petra. The ruins of a lost civilization with a temple, an amphitheater and dozens of tombs are scattered all over this area. Roman Amphitheater, one of Petra’s most well-known impressive remains, was built in the Greek architectural style in the 1st century and accommodates 7,000 people. The theater completely carved into the rocks was greatly influenced by the earthquake in 363. The renovated theater is closed to visitors; you can only see from a distant. In a large rocky area across the Roman Theater there are five huge graves. These “Royal Tombs” are bigger and more splendid than the other monumental tombs. The first one of the graves is “Urn Tomb”, which was used as a Byzantine church in the aftermath; the second is the “Silk Tomb”, which attracts attention with its colored sandstone rocks; the third is “Corinthian Tomb”, inspired by Nero’s Golden Palace and left unfinished; the fourth is Palace Tomb” built like a Roman palace; and the fifth is “Sextus Florentinus Tomb” made for Roman governor Sextus Florentinos. Among the remains on the road, a group representing Nabataean soldiers were performing a demonstration. The tiring walk, made occasionally on the stone ground and sometimes on desert sand, along with the remnants on either sides ended in approximately 2 km after the Treasury building, at the facilities located at the end of the road. It is possible to relax here, eat meals or have tea and coffee. After resting here, you follow the same path again for the return. It is also possible to rest again by the Treasury building and watch the performances of Bedouin youths on the camels and horses. Small stalls sell small things as if they are historical ruins. You may look at these, but I believe that they were not genuine and, moreover, very expensive. Therefore, I rather watched the people and the rocky town. On the way back, you climb up again over the Siq Canyon while following the colorful rock walls after leaving the Treasury building. However, this becomes fairly challenging with the effect of long walk during the day (4 km to one end, 4 km return totaling 8 km), warmth and desert air. You even have to rest a little on the flat area by the entrance gate you first arrived, once you go up. In the museum following this road, the objects removed during the excavations are exhibited. Also, if you are interested, it is possible to examine the writings and paintings on the big panel that tell the history, social life and legal system of the Nabataeans. This sculpture, made around 1st century BC, belongs to the Nabataean Goddess Dushara. The Nabataeans believed in the god named “Dushrara”, which means the master and the father of the mountains, and sacrificed for him. Nabataeans were a nomadic tribe who lived in Northwest Arabia. They appeared on the scene of history for the first time in the 4th century BC. They lived on the edge of the Jordanian desert. They settled in Wadi Musa, a safe place away from the attackers. Here they fed camels, sheep, goats, horses, and set up terraces in desert, raising vineyards and olives. They were known for controlling trade routes. They have mastered the trade of spices, incense, oil and perfume. They had trade relations with Romans, Hellenistic period Greeks and Persians, and sent caravans to Arabia to the Mediterranean, Egypt and Mesopotamia. Thanks to trade, they became very rich and influential, founded Petra, a magnificent city, and made it the center of a large trading kingdom. The language they speak is Aramaic, which is the basis of the Arabic language. Nabataean Kingdom was later invaded by the Romans and annexed to Rome in 106 BC. After earthquakes, changing trade routes and Crusades, the city was abandoned and buried in the depths of history while Nabataeans were also wiped away from the stage of history. Bedouins claim to be the grandchildren of the Nabataeans. The entry fee to Petra is 50 dinars per day, but you have to leave the ancient city by 16:00. It is also possible to watch the light and sound show made after it gets dark by paying extra 20 dinars. The next day another desert was waiting for us. It is said to be one of the most beautiful deserts in the world. The red lands once ruled by Nabataeans, Romans, Byzantines, Crusaders and Ottomans…Also called as “Moon Valley”. A vast area of 720 km2. The silence of the desert and the rocks of the sandy hills that change color according to the sunlight are mysterious and impressive. The night is said to be very beautiful too (an eternal darkness, if you want to watch the stars in the sky). But you need courage to spend the night in a tent in the desert. We stopped at a train station while we were moving with our bus in the desert. This is the Wadi Rum Station of the Hejaz Railway, the bridges of which were bombed by Lawrence in the World War I, now with the disassembled railway disappeared in the desert sand. A few wagons and locomotives stand with the floating Turkish flag, though. While the pride of seeing our flag in the middle of the desert, the pain of thinking about the money donated by our grandfathers for this railway, the observation of how British made strategic moves by promising to give freedom (!) to the Arabs in the region during the war were thrilling us with the unidentifiable feelings we waited for the wind to blow and make a picture of our floating flag. The Hejaz Railway is the division of the project between Damascus and Madina built by Abdülhamit II in 1900-1908 that aimed to connect Istanbul and Medina. Technical and material support was provided by the Germans in the construction of the railway, as well as donation support for the people. During the construction of the Hejaz Railway, 2666 stone bridges and culverts, seven iron bridges, nine tunnels, 96 stations, seven ponds, 37 water depots, two hospitals and three workshops were built. Desert is a ruthless natural environment. But the safari with a jeep was an incredibly enjoyable experience. Comfortable trousers and shoes, hat or a headscarf to protect your head from the wind and sand is necessary for this safari. After we moved for a while in the car, we stopped next to a sand hill; both to walk in the desert and to take pictures from the top. After a few steps you realize that it is not so easy to walk that sounds simple at the beginning. Your foot is falling in the sand, and you have a lot of difficulty walking again. But the desert gives you a feeling of eternity while walking; as if you have disappeared within the yellow sand of infinity. The camels walk past us as their legs are thin and feet are wide. The masters of the desert are bedouins, who are accustomed to live in difficult desert conditions. They offer tea and sell some local products in a long black tent of hair among the desert rocks. After we traveled in the deserts for days, the shores of the Red Sea were ahead of us; it was refreshing to see the sea and blue color. Aqaba is a port city with a population of 70,000 in the south of Jordan along the Red Sea. Jordan’s only port opening to the sea. Right next to Aqaba is Israel’s Eilat city. The coastline was chirpy with those walking and sitting in the cafe. You can enjoy yourself here at the seaside or you can sail and watch the submarine landscapes from the boats having glasses on their middle section. While we were at Aqaba, we wanted to see Aqaba Fortress, which has an important place in our history. But it was not possible for us to get in due to the ongoing renovation. The Ottoman inscription on the gate of the castle was removed and replaced by a Jordanian medal. Aqaba, which came to the rule of Muslims in the 7th century, was dominated by the Crusaders in 1115. Salahaddin Ayyubi took Aqaba back from the Crusaders in 1170. In the city that joined to the Ottoman lands during the Egyptian campaign of Yavuz Sultan Selim in 1516 a castle was built for the safety of the pilgrimage routes. This castle, built by the Ottomans, is described in detail in the travel logs of Evliya Çelebi. With the attack of the Arab nomads against the Turks, which rebelled with the instigation of Lawrence of Arabia after World War II, Aqaba came to the British rule and then became a city of Jordan in 1946. With the Palestinian refugees coming after the Arab-Israeli war in 1948, the population of the city grew rapidly. Phosphate, an important source of income for Jordan, is exported from the Aqaba port. We bid farewell to Red Sea on a colorful sunset. When we approached the Dead Sea, the last stop of the trip, the weather was dark. We saw the rock that was supposed to represent Lut’s wife as a silhouette. The Prophet Lut was believed to have been sent to the Lut’s tribe living in a region between today’s Israel and the border of Jordan. The rumor says that the rock standing like a thin sculpture on top of a hill is Lut’s wife who were turned into a stone, when Lut’s tribe was destroyed in this area. The Dead Sea or the Salt Lake is the lowest lake below sea level. No living creatures can survive as the mineral content is rich and it is too salty. Since the mud minerals on the shores are said to be healing, mud baths are also taken. Dead Sea, lying 420 meters below sea level, while we watch the scenery with Israel on the other side of the lake on the loungers under the parasols. Since the stones on the shores of the water are very slippery (like greasy), somebody in charge helps those who want to enter the water. They warn that water should not contact the eyes. It is not possible to sink in the water, but it is very difficult to move. I was fine with just standing on the edge and apply mud to my face. Soaps and creams made from Dead Sea minerals are sold here. Do not miss the opportunity to buy while you’re there. On the way back, I had the pleasure of smelling of soap in my suitcase and seeing the ancient lands in my mind. Jordan is the part of the picture to recognize and understand the Middle East as a whole. Jordan is a young state, but bears the traces of many civilizations and states in its past. It is an ideal travel route for those who want to make a trip in history – time tunnel – and feel the eternity of the desert when doing a touristic trip. During the trip, while observing the similarities and differences of neighboring countries, I could not figure out exactly what the boundaries meant. Do you think Jordanian poet Hisram Bustani’s words reflect this? Who drew the border between the river and the river bank? Who drew the boundary between the wind and the cloud?